The name means plain, the plain in this case lies between the Apennines and the Tyrrhenian Sea. The district extended originally from the River Sele in the south to beyond the River Volturno in the north, and in the Augustan era formed the south of the Latium et Campania region. Later reforms divided Roman Italy into provinces: the province of Campania included much of Latium, though Rome and its immediate environs remained separate. In the early middle ages there were small Duchies – Naples, Amalfi, Gaeta – on sections of the coast: these were usually loyal to the Byzantine Empire, though self-governing. The Lombard Principality of Benevento held inland Campania and some of the coast; it later broke up and the Principalities of Capua and Salerno both held lands in Campania. By the 12th century Campania belonged to the Kingdom of Sicily and remained in the Kingdom (Regno) of the southern mainland until Italian unification in 1860 (the only part of the present-day autonomous region which was not in the Regno is Benevento, a Papal territory until 1860). In the Regno Campania was divided between the Terra di Lavore in the north and the Principato in the south. The Principato included lands beyond the old Campania and in common parlance Campania in the 19th century extended both southwards and into the mountains to include all the Principato territory. It is this larger Campania that is the modern region. The autonomous region was provided for at the beginning of the Republic in the late 1940s but only became effective in the 1970s. Its northern limit is the River Liri, somewhat to the north of the boundary of the original Campania though well to the south of the northern boundary of the Roman province. In the south the region extends well beyond the River Sele, the original limit, to the northern shores of the Gulf of Policastro, whilst inland it extends to, and in the northeast beyond, the watershed of the Apennines. 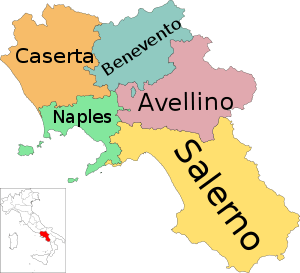 Its five provinces are (clockwise from the northwest): Caserta, Benevento, Avellino, Salerno and Napoli. In area Campania is 12th of the 20 regions of Italy, but in population it is only exceeded by Lombardia. This entry was posted in Italy and tagged Amalfi, Byzantine Empire, Campania, Roman, Rome, Salerno. Bookmark the permalink.